Perched on the side of a hill this contemporary beach house overlooks the trees and ocean of Emu Bay on Kangaroo Island. 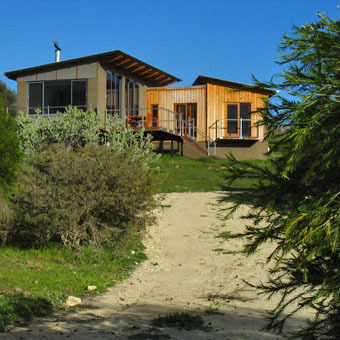 The house is designed as a coastal retreat and has an intimate connection to its bush surroundings and nearby sea. Here one can experience the comforts of a simple modern beach house in a 5 acre setting. The location, the incredible views and the house provide for a perfect retreat, a holiday and a place for relaxation in all seasons.